As usual a very interesting article – I find the samples very demoware friendly and would really like to use the QA on a model I created and see how the users of such a model would respond to the QA feature. Have you had time to run questions against your own models? 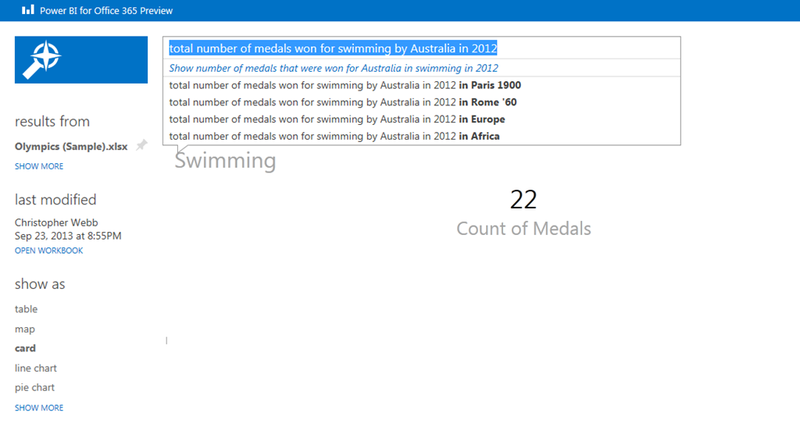 Questions phrased like ‘medalist where count of olympic name is greater than 3′ are exactly what I was talking about when I said that developers have an advantage over regular users – I see see that you are thinking in SQL! No, I haven’t run questions over my own models yet because it isn’t supported in the Preview. At the moment you can only ask questions against the sample models. I have been skeptical about Q&A from the start. After all, we still don’t have perfect grammar correction, text-to-speech, or language translation software because context is so difficult to interpret. Q&A is in the same boat. Of course you wouldn’t know from the highly edited videos that show it working perfect every time! I haven’t tried Q&A myself – I’ve abandoned my Power BI efforts for now because, even after following the provisioning video to the letter, my Sites link was never enabled. 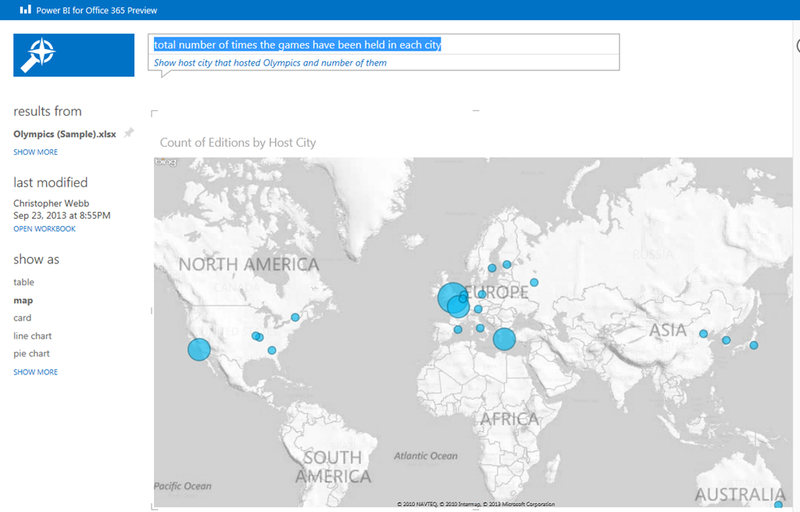 Chris – by any chance, do you know, if the Q&A feature of running our own data models is enabled now (Dec 5 2013)? 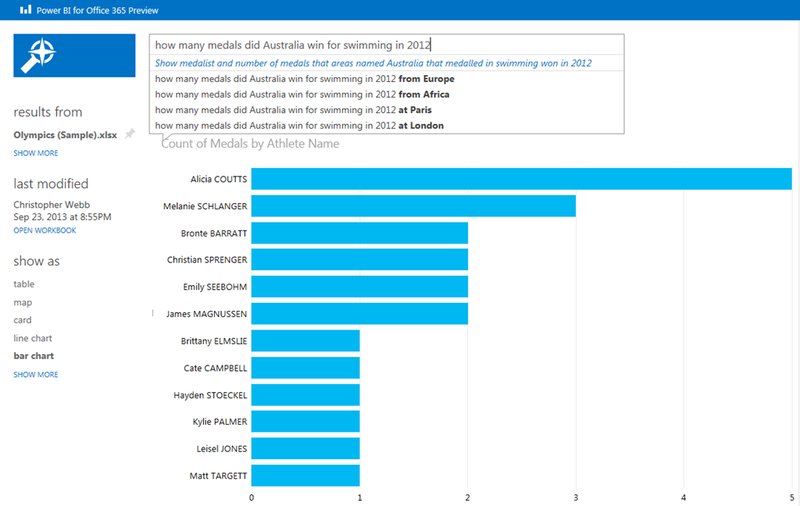 Although the question about athletes didn’t turn up in Google, did you manage to bring the results forward in Wolram Alpha? (I didn’t). The aim and structure of Wolfram Alpha is much more akin to the Power BI “Computational Knowledge engine” than Google is. Natural Language Search is one of those ‘cool’ things that will help drive adoption of self service, even if ultimately you’ll prefer to use the normal capabilities of the tool. But it has to work… I once tried out a BI product that had natural language search as one of its unique selling points, where it presented the user with different search results like google does, with each result being a visualisation. So I started off like you did, with simple stuff. In fact, I tried the simplest query I could think of. It didn’t work, in my eyes- the ‘right’ set of data was 7th or 8th in the list. To use these things you need to a) understand all the terminology that is in the underlying model (know that it is athlete rather than sportsman) and b) the exact way to phrase it (i.e. know that total number is something the tool understands). In this, it is no different to any other self service tool- you need to train the users on the tool and the data at least a little before they can get the most out of it, as well as constructing a really good model that is going to be easy for people to work their way around. 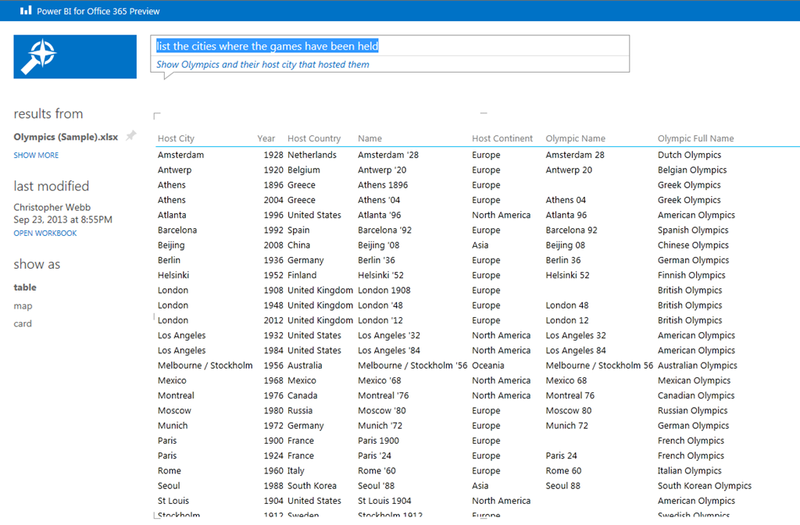 In fact, since you have to do that, why wouldn’t your users prefer a simple drag and drop tool like PowerView, that at least shows you what’s available before you create your query? Has the ability to use own workbooks for Q&A been enabled yet? I don’t think you can yet – it should ‘just work’ if you upload your data to a Power BI Preview site, but at the moment you can only use the sample Q&A workbooks.